People who struggle to feed themselves, get dressed, learn and work... depend on occupational therapy assistants and aides-to help them reach their goals. These professionals help patients gain skills and learn new ways to perform activities of daily living, whether at home, school, or work. Occupational therapy-or OT-assistants carry out treatment plans made by occupational therapists, treating patients from young children to older adults. They guide patients in the use of special equipment, and teach new ways to approach tasks such as moving from bed to a wheelchair. They document each step of patients' progress, and consult frequently with the OT. Occupational therapy aides keep treatment areas clean, equipped, and ready for the next patient. They assist patients in moving to and from treatment areas, schedule appointments, and help patients fill out billing and insurance forms. 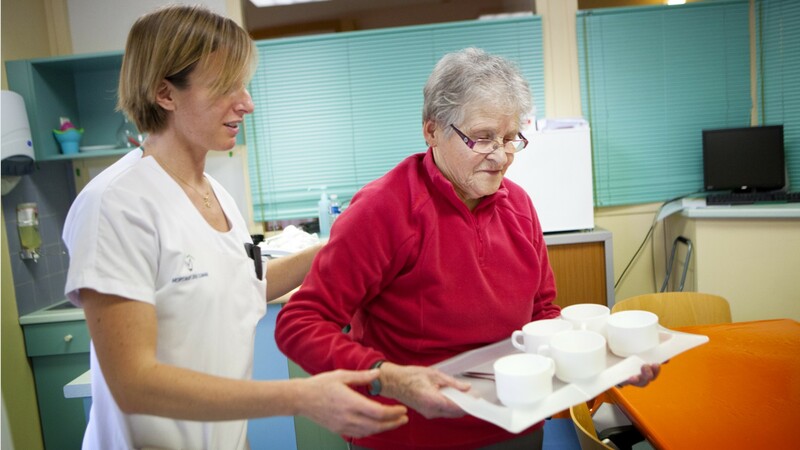 Most assistants and aides work in occupational therapists' offices, hospitals, and nursing care facilities. Both spend many hours a day on their feet, setting up equipment, bending, and lifting patients when necessary. Evening and weekend hours may be required. Occupational therapy assistants need an associate's degree from an accredited program, and, in most states, a license. Aides typically have a high school diploma or equivalent, and are trained on the job. Helping restore meaningful activity to the lives of their patients... provides a sense of purpose to OT aides and assistants. See more details at O*NET OnLine about occupational therapy aides. Occupational Therapy Aides by U.S. Department of Labor, Employment and Training Administration is licensed under a Creative Commons Attribution 4.0 International License.